As everything else in India, taxi fare comes at a wide range, subject to your negotiation skills. One day we were 6 people going from Darjeeling downtown to the Sakya Guru Monastery at Ghoom. Rinpoche brought us to a public taxi booth. Seeing us obviously as foreigners, immediately they asked for 500 Rupees. Rinpoche negotiated the price drastically down to 300 Rupees. Though Rinpoche said the front seat can be seated with two persons, we all wanted him to sit comfortably. So Rinpoche sat in the front seat, the four Singaporeans squeezed in the middle row while I sat on the spare tire at the luggage space. Another day, only 2 of us were going to the monastery. We went down to the main road towards Ghoom and met these 2 local old ladies who are committee members of the monastery. These Tibetan seniors active in the community are always very fit. They quickly went on to hail a taxi. And the price they negotiated was a mere 100 Rupees! On the last day, only myself went to the Ghoom Monastery so I tried the shared taxi. The fare was only 15 Rupees per head for this pleasant 20 minute journey. Though they only charge 15 Rupees per person, the driver was actually very skillful in squeezing so many passengers inside his car. As Rinpoche said, the front seat can indeed accommodate 2 passengers. In my ride, not only 2 passengers, but 3 passengers in the front seat plus the driver! Hence it was really an eye opening experience to see this driver driving with only half of the steering wheel! In the end, we had 4 people in the front row, 4 people in the middle row, and 6 people in the back seats within one jeep. Actually one guy in the back wanted to climb on the car top to sit more comfortably but got stopped by the driver. If more people needed a ride, the driver can probably take up to 20 people within his car! 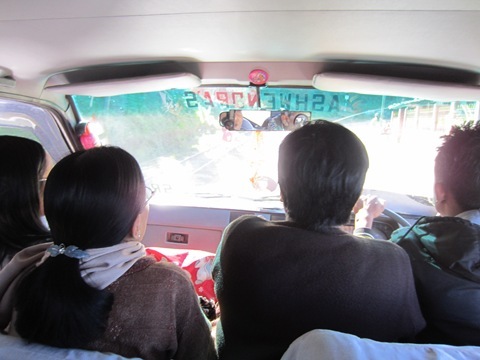 The shared Jeep ride from Darjeeling to Kalimpong is even more amazing. As more people joined the ride along the way, in the end, there were 4 people in the front row, four people in the middle row, and 4 people in the last row – completely packed! 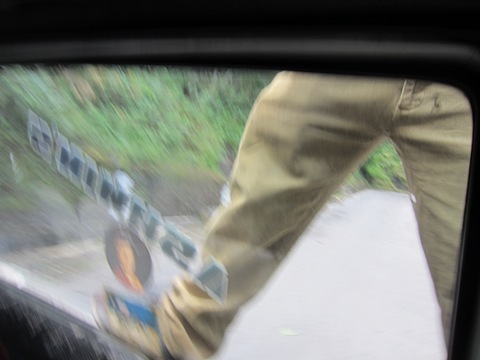 When the last person came, as the car was full and even the car-top was occupied by luggage, this person, the 12th passenger, can only grab the car-top rack and stand on the spare tire, literally hanging all the way down to Kalimpong. 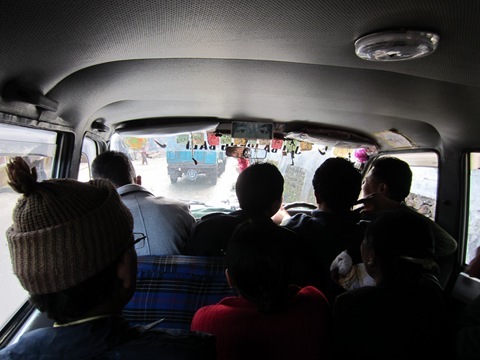 In Kaimpong, someone from Canada said he once sat by the driver in this kind of situation. So he had to split his leg wide open so that the driver can shift the gear inbetween his legs! And the worst part is when the driver had to press the crutch, often his foot was troden badly altogether. Nevertheless, shared taxi/jeep is still an economical way to travel around this area. 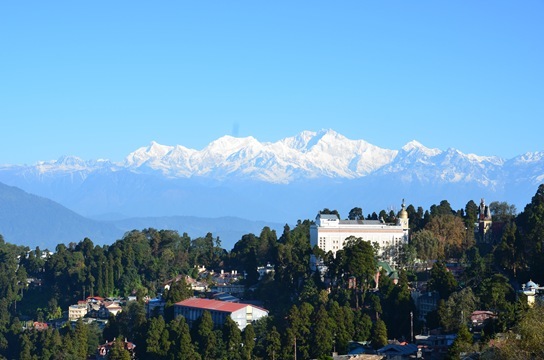 Compared to easily 1500 Rupees-2000 Rupees to hire a car by yourself, shared-ride fare for Darjeeling-Kalimpong (2 1/2 hour) costs less than 100 and Kalimpong-Gangtok (3 hour) only 100 Rupees. Buying an extra front-seat ticket would be the best for a comfortable travel. I thought I did in the posting about Nagarkot, no?